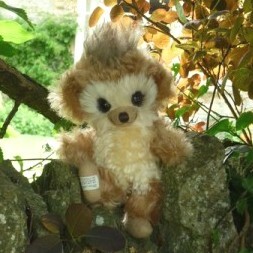 Punkie Baby Owl is made of long and wavy, light brown mohair with a brown-tipped topknot, white mohair face and cream mohair body front. He has painted detail around his amber and black safety eyes. His muzzle and feet are felt. He is softly filled with polyfibre.